The Gate House is a sympathetically converted detached barn situated on the outskirts of Bath with two double bedrooms, one with en-suite, sleeping 4 people. There is ample parking at the property and there is a dedicated parking space in Bath City Centre for the use of guests. 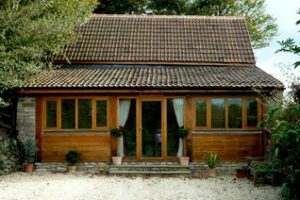 The Gate House is a sympathetically converted detached barn situated on the outskirts of Bath with two double bedrooms, one with en-suite, sleeping 4 people. 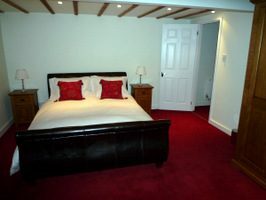 However, it is a large property and there are two double sofabeds located in the sitting room and dining room which can be used for additional occasional sleepers. There is ample parking at the property and there is a dedicated parking space in Bath City Centre for the use of guests. 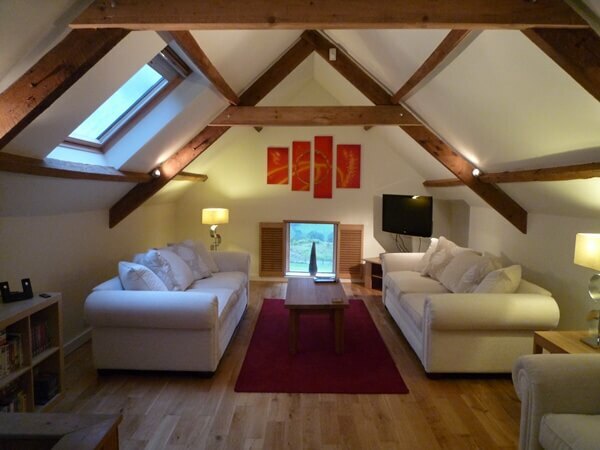 Designed as self-catering accommodation, it is spacious and modern whilst retaining many of the original wooden beams. 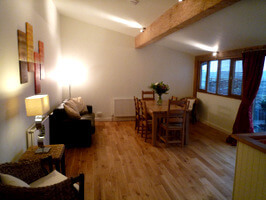 The Gate House is set over two floors with a spiral staircase leads up to the Sitting Room. 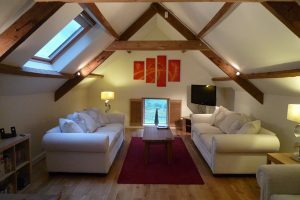 This large and spacious room enjoys magnificent views over Langridge valley and is an ideal space to chill-out after a day’s shopping in Bath. 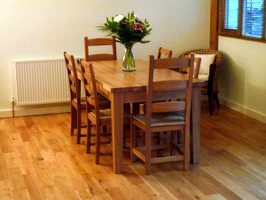 The oak floor and large comfy sofas are designed for relaxation and, for those who want to watch TV or play games there is a 37″ flat screen TV, PlayStation 2/DVD player, a video player and IPOD docking station with speakers. 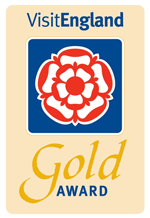 Guests should be aware that we are situated on the main A46 road into Bath – the Gate House having been built long before the road. The property is well insulated and sound proofed, however, there is some background road noise in the property. 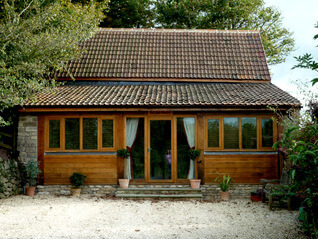 Location: The Gate House is situated on the A46 approximately 4.5 miles from Bath City Centre. 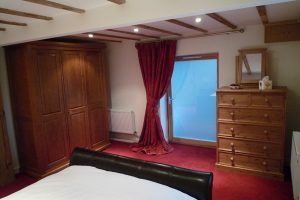 It’s location is ideally situated for easy access to Bath City Centre and the M4 motorway. 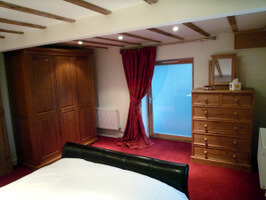 Bedrooms: There are two double bedrooms (one with en-suite), each with a king size sleigh bed and plenty of storage. A hairdryer is also supplied in each of the bedrooms. Bathrooms: There are two bathrooms, one of which is an en-suite to the second bedroom. The main bathroom benefits from a bath with shower over and the en-suite has a large walk in shower. 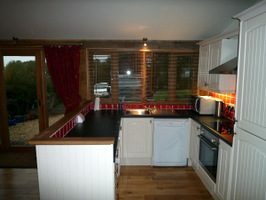 Kitchen: The kitchen/diner is situated at the front of the property and benefits from a washer/dryer, dishwasher, microwave, oven, fridge and freezer. 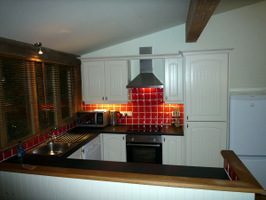 The kitchen is well equipped and spacious with oak flooring and lofty ceilings. Entertainment: In the sitting room there is a 37" flat screen TV, PlayStation 2 and DVD player. There are also a wide range of films and games available. Outside: There is a small courtyard at the rear of the property which is accessed from both bedrooms. This is an ideal area for a BBQ (provided) or simply somewhere to sit and drink a glass of wine. 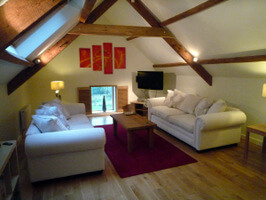 General Points: Wi-Fi, Central Heating, Linen/Towels and two toilet rolls per bathroom are supplied. Parking: Ample parking is available at the front of the property. Additionally an allocated parking space in Bath city centre is provided for guest to use. Children: Children of all ages are welcome at The Gate House. We can provide a travel cot but would ask guests to provide their own cot bedding. Food Stores: Morrisons Supermarket is situated on the London Road on the road into Bath approximately 3.9 miles from The Gate House. Local Pub/Restaurant: There are two villages close to The Gate House, Marshfield (which is North of the property) and Bathampton to the South. 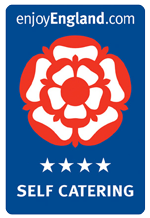 The Catherine Wheel pub and restaurant at Marshfield is situated just off the A420 – 3.8 miles away and takes is 10 mins by car. The Gate House is just ten minutes’ drive from Junction 18 of the M4 motorway and only a further ten minutes to Bath City Centre. Its ideal position enables you to enjoy Bath’s countryside and the architecture and spending opportunities in Bath City Centre. Further shopping opportunities can be found at Cabot Circus and Cribbs Causeway both reached in about half an hour (depending on traffic), and Cardiff which can be reached within an hour. These shopping areas can also be easily reached by train. Other local attractions include Longleat, Lacock, Stonehenge, Salisbury, Wells and the Cotswolds.